Fill 9x13 pan with washed, quartered, and trimmed potatoes, carrots, onions and green beans. Mix together minced garlic, sage, oregano, basil, paprika, salt and pepper in a small dish. Drizzle 2 Tbsp of olive oil over the vegetable mixture and add enough seasoning mixture to lightly cover vegetables and toss to coat. 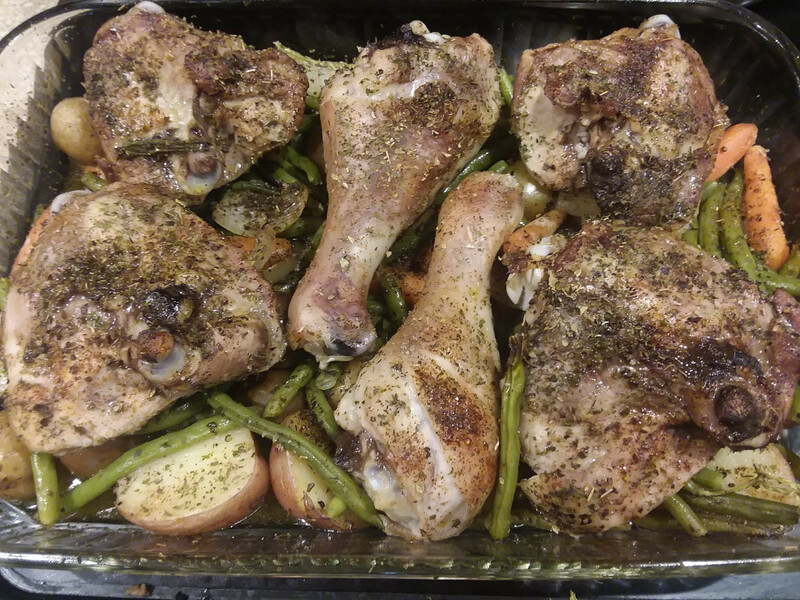 Place thawed bone-in chicken thighs and drumsticks on top of vegetables, rub both sides with remaining olive oil and sprinkle with remaining seasoning mix. If you do not eat the skin, cook with skin side face down. If you do, place skin side up, it will brown nicely.